(Bloomberg) -- Federal Reserve Bank of Boston Eric Rosengren said he favors shortening the average maturity of Treasury securities held in the U.S. central bank’s balance sheet as a way of preparing for the next recession. Rosengren said the Fed may in the future find itself needing to repeat the crisis-era tactic it used in 2011 of selling short-dated Treasuries to purchase longer-term bonds to lower borrowing costs and aid the economy. But at the moment it holds almost no Treasury bills, which are securities with maturities of one year or less. U.S. central bankers have some time to go before they decide on what the average maturity of their asset portfolio will look like in the longer run. But they’re starting to publicly debate the question. Rosengren’s comments follow remarks on the topic Monday by Philadelphia Fed President Patrick Harker and Charles Evans of Chicago. Rosengren also spent time trying to dispel what he called “misconceptions” about the balance sheet, while making clear he expects the central bank will have to turn to large-scale bond purchases to fight future downturns. “It is important for market observers, lawmakers and the public to become more comfortable with the benefits of central banks using their balance sheet tools to pursue the public interest,” he said. The Fed is currently shrinking the balance sheet, a process that’s now scheduled to finish in September, earlier than many Fed watchers had anticipated. Policy makers aggressively expanded the balance sheet through three rounds of bond purchases, which was designed to lower long-term borrowing costs during and after the financial crisis. After peaking at $4.5 trillion, it has fallen to below $4 trillion. Rosengren worried that many observers, including market participants, still believed the Fed should bring the balance sheet back to pre-crisis levels, around $1 trillion. He said that was “neither desirable nor feasible” because of growth in liabilities the Fed had no control over, like outstanding currency and the amount of bank reserves required by post-crisis regulation. U.S. currency in circulation worldwide, alone, has more than doubled from the pre-crisis $700 billion to $1.66 trillion, he said. 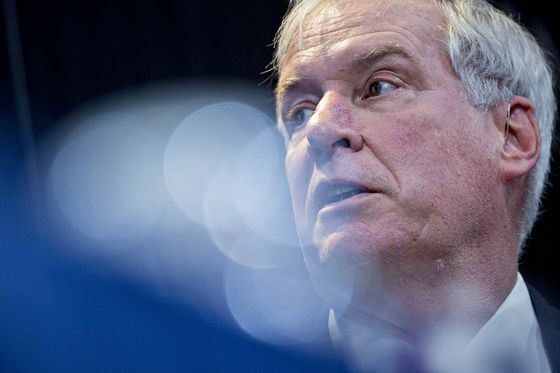 In an interview with Bloomberg News last week in Boston, Rosengren said the Fed’s recent decision to halt runoffs from the balance sheet later this year had nothing to do with monetary policy. He also called “spurious” any claims that the runoffs had contributed to financial market turmoil late last year. Rosengren noted that officials have declared they will leave bank reserves at an “ample” level because the Fed’s mechanism for controlling rates would break down if reserves become scarce. Policy makers, however, have not yet decided precisely what “ample” means. The ultimate size of reserves, Rosengren said, would be determined by the amount of volatility Fed officials are prepared to tolerate in short-term interest rates. “If you actually think there’s a lot of cost to having a lot of volatility in short-term interest rates, you’re going to prefer to have a bigger buffer,” he said in the interview.